The vast majority of standard upright home carpet shampooers will have a single motor handling both the rotation of the cleaning brushes and the suction of excess water from the carpet or upholstery. Any motor which has to do double-duty in a carpet cleaning device will be strained to deliver an award-winning cleaning performance. The Bissell 86T3 carpet cleaner features a dual motor design, with one motor rotating the brushes, while another motor is used to scoop up excess water and solution from the carpet. Dual motors will win out in performance every single time, but dual motor designs also cost a lot more. Professional/ light commercial carpet extractors for home users are built to much higher workmanship standards than regular-grade cleaners. They tend to last a lot longer, and are free from problems like leaking tanks or clogged piping that regular upright cleaners sometimes unfortunately face. This keeps the user experience of professional cleaner machines hassle-free, as they do not have to deal with problems of getting their machines fixed as often. In addition, they are known to last longer on average. In fact, the manufacturers themselves are aware of this, and therefore willing to give a longer warranty for professional grade machines. Manufacturers often provide a 4 to 5-year warranty when it comes professional machines, vs. 1 to 3 years for regular upright cleaners. As explained above, since professional/ commercial grade machines are built to higher quality standards, manufacturers have the confidence to support a longer period of warranty. The longer period of warranty is also a reason that some users pick a professional cleaning machine. They know that by spending a bigger sum upfront, they are assured of a powerful machine that cleans extremely well, and that will work well for years to come. Professional grade carpet shampooers that are sold to commercial users, however, have shorter warranty periods. For example, the Bissell BG10 carpet extractor, the same machine as the Bissell 86T3 but sold for commercial uses, has a 1-year warranty. This makes sense, as manufacturers would expect a commercial carpet cleaner to be used in a commercial setting, suffering more wear and tear as a result. Professional/ light commercial carpet cleaners can cost several hundred dollars more than regular carpet cleaners, although the price difference is usually no more than about $300. 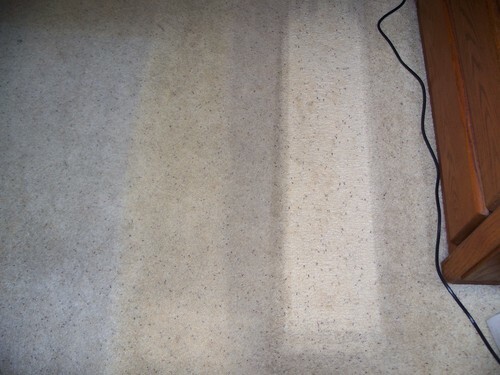 A best-selling and top-rated regular upright cleaner like the Hoover Power Scrub Deluxe costs around $180, compared to around $400 for the well-known Rug Doctor Mighty Pro carpet extractor. Although users pay more for a professional grade carpet cleaning machine, they do get more bang for your buck as a result. If you compare the water storage and cleaning capabilities of a commercial cleaner to the same cleaning and water storage features of a regular household carpet cleaner, the numbers speak for themselves. Your final decision won’t necessarily come down to cost alone. It also depends on your carpet cleaning situation. The fact remains that larger households with pets will benefit more from the sheer power of a professional carpet cleaner, whereas small households dealing with small carpeted areas may find their needs well-served by a less costly regular upright carpet cleaning machine. The Hoover Power Scrub Deluxe FH50150 weighs just 19 lbs. It’s very light compared to professional grade machines weighing 40 lbs or more. One thing you’ll notice about any professional carpet cleaner – the Bissell 86T3 being example – is the sheer physical size and weight of them. It’s not that they’re so bulky or heavy you’d never manage to operate them, but they do tend to weigh 10-15 pounds (without water) more than a regular carpet cleaner. If you compare the Bissell 86T3 which weighs 42 pounds to the Bissell 8852 Essential Carpet Cleaner which weighs 24 pounds, there’s a weight difference of almost 18 pounds. When you factor in that the Bissell 86T3 has a higher water storage capacity, it adds further to the weight. Fortunately, carpet cleaning machines, whether they are professional carpet cleaners like the Bissell 86T3 or Rug Doctor Mighty Pro, or lighter upright machines like the Bissell 8852 Essential or Hoover SteamVac, are all ergonomically designed to be easy to pull and push on wheels. Home users who need to clean multiple floors may want to be cognizant of the weight that they can comfortably handle, or else have help available if they need to bring the machine up and down the stairs. Professional carpet cleaning machines tend to be bulkier, although they may not have as large a footprint as their weight suggests. For example, the Bissell 86T3 measures 11 inches wide, 20 1/2 inches deep and 42 1/4 inches high (but handle can be folded down to a lower height). The regular upright Bissell 8852 cleaner measures 11 inches wide, 20 inches deep and 43 inches high (handle can’t be folded down). The Hoover Power Scrub FH50150 pictured at the top of this page measures 11.5 inches wide, 17.25 inches deep and 43.25 inches high (handle can’t be folded down). Regular upright carpet shampooers may still make more sense for smaller living spaces as they are lighter, less bulky and will still get the job done. For some people, it may feel like an overkill to store a heavy-weight machine at home just for cleaning one or two rooms every month. A two-tank system is considered easier to use. They are found in professional/light commercial grade machines, as well as regular Hoover upright cleaners. Professional carpet cleaning machines typically have two-tank systems – one for handling clean water and one for collecting the dirty water to be dumped. Bissell’s regular upright cleaners typically use a single tank with a flexible “bladder” membrane pouch holding the clean water. Hoover’s regular upright cleaners have a separated two-tank system. Although Bissell’s single “bladder” tank system works OK, a two-tank system appears to be favored by more people. Professional carpet cleaning machines have larger sized tanks to hold more water. This allows for more cleaning to be done without having to stop and refill the tanks. The Bissell 86T3 Professional Deep Cleaner has a tank size of 1.75 gallons vs. a 1 to 1.25 gallon tank size for most regular upright cleaners. If you are unsure of whether to purchase a professional grade or regular upright carpet cleaner machine, it doesn’t have to be an all or nothing decision. Especially for first time buyers without much experience in owning carpet cleaning machines, getting a professional grade machine may seem intimidating. One suggestion is to purchase a basic upright cleaner machine for $150 to $200 for regular use around the home. Then, in times when carpets get really dirty, you can supplement its use by renting a commercial machine or engage professional cleaning services to help. There are a number considerations to keep in mind when it comes to choosing between professional/ light commercial grade machines or regular upright carpet cleaners. Some will stand out more than others, and tilt your decision one way or other. Thank you. Very good information on pros and cons and what to look for. This is a first time purchase. Have used rug doctor before and didn’t like having to clean it first. This site contains advertising links. See AD Disclosure. What Are The Best Handheld Carpet Cleaners? Limitation: We put every effort to provide the most accurate and helpful information on this site but we cannot provide any warranties on this information. Your use of our website or materials linked is completely at your own risk. Please always do your own due diligence before making a purchase or trying the product. In addition, some cleaning or stain removal methods discussed on this site may not work and even cause harm. Please always exercise caution and verify the information before using it. See full Terms of Service.